The idea that there is someone out there to save us is as old as humanity. But there is something specifically American in the idea that our savior has A. one name; B. speaks little, if at all; C. comes from the east and moves on to the west; D. fights not one individual but entire gangs of bad guys or invaders. You get the idea, and by now you have identified the Lone Ranger and the original Sprint UPS guy who first made the world safe for cellular. Because this stranger, is unknown to the community which he comes to save prior to his arrival, he is known to folklorists as the “mysterious stranger.” He sits among the great icons of folktales along with the trickster and the maiden in distress. But unlike our maiden who is saved by a gallant who stays to court and marry her, or the trickster who lives to deceive another day, the mysterious stranger must disappear and not become part of the community, unless he gives up the m.h. identity. (Lassiter in Zane Grey’s, Riders of the Purple Sage, stays with the girl, but he gives up his bad-guy hunting.) Like many folk images, the m.h. 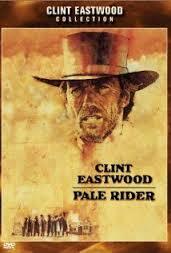 has been used effectively in literature, mostly pop, and films such a Shane and the excellent remake, Pale Rider, notice these characters have no back story, only rumors. This legend traveled across America with the westward moving frontier. Although in literature and film we only meet him in the far west of the late nineteenth and early twentieth centuries, he first appeared in a Massachusetts in 1675. Hadley and other towns in the Connecticut Valley had been designated frontier towns by the General Court (Mass. Legislature) during King Phillips War. They had petitioned for that designation to get tax relief and be able to pay for their own defense. (This story is from East Anglia, the section of England where most of the settlers in Massachusetts had their origins.) The tale is about an attack in East Anglia by Danish invaders in 1014, just three years prior to Danish Rule of the nation from 1017-1066. King Edmund, known at Saint Edmund for his chaste life, had fought and been martyred in a previous attack. During that battle he was beheaded. According to legend, in the attack which occurred in 1014, an old man with a scarf around his neck rose and rallied the town against the invasion and saved the town. Here is the tale. — Riley’s Roger de Hoveden’s Annals. 1014? J. Varden, East Anglican Handbook Edwin Sidney Hartland, County Folklore printed extracts number 1. Gloucestershire and East Anglia. (Gloucester: Davies and Son, 1892), 75-77. In the year 1014 the tyrant Sweyn, after innumerable and cruel misdeeds, which he had been guilty of either in England or in other countries, to complete his own damnation, dared to exact a heavy tribute from the town where lies interred the uncorrupted body of the royal martyr Edmund, a thing that no one had dared to do before, from the time the town was given to the Church of the above named Saint. He repeatedly threatened, also, that if it was not quickly paid, beyond a doubt, he would destroy the Church of the martyr himself, and torment the clergy with various tortures. In addition to this he even dared to speak slightingly of the saint himself and to say that he was no saint at all… in a general council he held at a place called Geagnesburt (Gainsborough), he had again repeated these threats, while surrounded with most numerous crowds of Danes, he alone beheld Saint Edmund coming armed towards him; on seeing whom he was terrified, and began to cry out with loud shrieks, exclaiming, “fellow soldiers, to the rescue, to the rescue! Behold St. Edmund has come to slay me;” after saying which, being pierced by the Saint with a spear, he fell from the throne upon which he was sitting, and suffering great torments until nightfall, on the third day before the mones of February, terminated his life by a shocking death. The second point of origin is at the beheading of Charles I in 1650 and the restitution of the monarchy with the coronation of Charles II in1660. Charles II was of course unhappy over the regicide of his father and sent his soldiers to find, try and execute those responsible. This was accomplished messily but easily in England, but it was harder in America where colonists, Puritan and sympathetic to Cromwell and the Parliamentarians hid two of the regicidal judges in Boston, New Haven and up the Connecticut Valley to Hadley, Mass. Because the agents of the King might be anywhere, the judges Gen. Whalley and Gen. Goffe, both soldiers who had served in Cromwell’s army, were kept in basements and regularly moved between towns. This story was collected and retold many times. Here is one from: Charles M. Skinner, Myths and Legends of Our Own Land vol. 2. (Philadelphia: J.B. Lippincott Company, 1896), 16. There was that in the air of the New World that made the Pilgrims revolt against priest and kings. The revolution was long-a-breeding before shots were fired at Lexington. Stout old Endicott, having conceived a dislike to the British flag because to his mind the cross was a relic of popery, paraded his soldiers and with his sword ripped out the offending emblem in their presence. There was a faint cry of “treason!” but he answered, “I will avouch the deed before God and man. Beat a flourish drummer. Shout for the ensign of New England. Pope nor tyrant hath part in it now.” And a shout of huzza of independence went forth. With this sentiment confirmed among the people, it is not surprising that the judges who had condemned a papist king- Charles I- to the block should find welcome in this land. For months at a time they lived in cellars and garrets in various parts of New England, their hiding places kept secret from the royal sheriffs who were seeking them. For a time they had shelter in West Rock, New Haven, and once in that town they were crouching beneath the bridge that a pursuing party crosses in search of them. In Ipswich the house is pointed out where they were concealed in the cellar and the superstitious believed that, as a penalty for their regicidal decision, they are doomed to stay there, crying vainly for deliverance. Philip, the Naragansett chief, had declared war on the people of New England, and was waging it with a persistence and fury that spread terror through the country. It was a struggle against manifest destiny, such as must needs be repeated whenever civilization comes to dispute a place in new lands with savagery, and which had been continued, more and more feebly, to our own day. The war was bloody, and for a long time the issue hung in the balance. At last the Indian king was driven westward. The Nipmucks joined him in the Connecticut Valley, and he laid siege to the lonely settlements of Brookfield, Northfield, Deerfield, and Springfield, killing scalping and burning without mercy. On the 1st of September 1675, he attacked Hadley while its people were at church, the war-yelp interrupting a prayer of the pastor. All the men of the congregation sallied out with pikes and guns and engaged the foe, but so closely were they pressed that a retreat was called, when suddenly there appeared among them a tall man, of venerable and commanding aspect, clad in leather, and armed with a sword and gun. His hair and beard were long and white, but his eye was dark and resolute, and his voice was strong. “Why sink your hearts?” he cried. “Fear ye that God will give you up to yonder heathen dogs? Follow me and ye shall see that this day there is a champion in Israel.” Posting half the force at his command to sustain the fight, he led the others quickly by a detour to the rear of the Indians, on whom he fell with such energy that the savages, believing themselves overtaken by reinforcements newly come, fled in confusion. When the victors returned to the village the unknown champion signed to the company to fall to their knees while he offered thanks and prayer. Then he was silent for a little, and when they looked up he was gone. They believed him to be an angel sent for their deliverance, nor till he had gone to his account did they know that their captain in that crisis was Colonel William Goffe, one of the regicidal judges, who, with his associate Whalley was hiding from the vengeance of the son of the king they had rebelled against. After leaving their cave in new Haven, being in peril from beasts and human hunters, they went up the Connecticut Valley to Hadley, where the clergyman of the place, Rev. John Russell, gave them shelter for fifteen years. Few were aware of their existence, and when Goffe, pale with seclusion from the light, appeared among the people near whom he had long been living, it is no wonder that they regarded him with awe. Whalley died in the ministers house and was buried in a crypt outside of the cellar-wall, while Goffe kept very much abroad, stopping in many places and under various disguises until his death, which occurred soon after that of his associate. He was buried in New Haven. The legend moved on and the frontier with it, but it is interesting to find that the most developed and inhabited areas were not only, once wild, but really considered themselves the frontier, one that needed a mysterious stranger in times of great danger. Wonderful piece and great insight. I would throw “The Dark Knight” of Christoper Nolan fame into the mix as a metaphorical embodiment of the “Mysterious Stranger” ideal.